Wasps have signed versatile Italy back Matteo Minozzi for next season. The 22-year-old, who will join from Italian side Zebre, is sidelined with a knee injury but hopes to be fit for the 2019 World Cup in Japan. 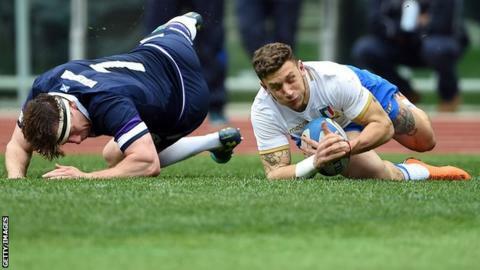 Minozzi, who can play as a full-back or winger, made his international debut in November 2017 and scored four tries in the Six Nations in 2018. "Matteo has bags of promise and plenty of international experience," director of rugby Dai Young said. "He was tremendous at last year's Six Nations with four tries in five games, and it's a shame we're not going to see him in the tournament this year. "No doubt when he recovers he will be playing at the World Cup - and hopefully he'll be able to give Wasps fans a taste of what they'll be seeing at the Ricoh next season."